Epiphany is a Christian feast day that celebrates the revelation of God the Son as a human being in Jesus Christ. Western Christians commemorate principally (but not solely) the visit of the Magi to the Baby Jesus, and thus Jesus’ physical manifestation to the Gentiles. The Epiphany is an interesting time in the Christian Year. There is some confusion of what exactly it is. This is due to the pop culture, secular version of the Christmas story. Society tells us that when Jesus was born, the Three Wise men travelled far and wide and arrived just minutes after Jesus’ birth (or minutes before, depending on the source). The Three Wise Men, the Shepherds, the Little Drummer Boy, the Blessed Virgin, St. Joseph and the animals we all present right? The Three Wise Men were an adaptation of the Magi as depicted above. 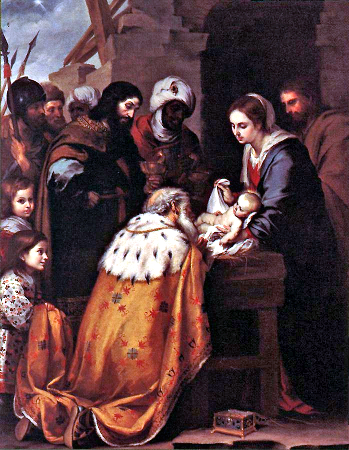 The Magi arrived about a week after Jesus was given his name officially in the Temple, and when his circumcision was performed. Yes, the Magi did come bearing gifts to the child who is the Messiah. The lesson that I gather from this mishap is that proper study of the Bible is quite important. Not every can go to seminary, nor should they. But it is the responsibility of the believer to seek the proper education by reading the Bible, asking questions of the clergy and attending services.